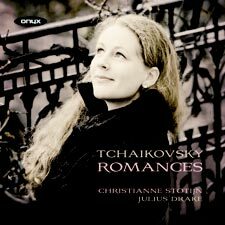 Christianne learnt Russian especially for this recording and toured it widely before recording it with her superb pianist Julius Drake. This recording should do much to re-evaluate Tchaikovsky as one of the greatest composers of song and not just a writer of pretty tunes. Christianne was recently a BBC Young Generation Artist and has had London dates with Haitink (Mahler 2) and Das Lied von der Erde with Budapest FO/Ivan Fischer. Forthcoming highlights include Covent Garden debut (title role) in Tamerlano and Handel’s Jephthe with Paul McCreesh. As singer and pianist tug telepathically here and there at this delicate music’s tempo, the world seems momentarily to stop turning. Julius Drake’s focused narratives make us want to hear even more from him.